There are two different Team Magma Hideouts, the one in Ruby and the one in Emerald. The entrance to the Team Magma Hideout in Lilycove City in Ruby. 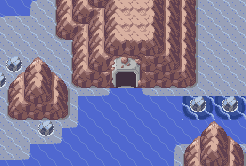 The Team Magma Hideout in Pokémon Ruby is found in the cove east of Lilycove City (in Sapphire/Emerald this is the location of Team Aqua Hideout). It requires surf to reach and enter. If the site is not yet open, then two grunts will block passage, giving a hint on where to go next. Proceed up the stairs, and you will reach a teleport maze. In the first room, you can take the south teleport to get a Max Elixer, ot the north pad to proceed to the next room. The branch to the left leads to a teleporter maze. Take the teleporters in the following order: Left, middle, right, right. This leads to four pokéballs, containing two Electrode (lvl. 30) (with self destruct), Nugget and a Master ball. The submarine will depart without you, and you will have to chase after it by heading east from Lilycove. 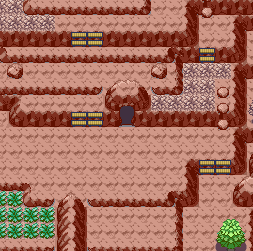 The entrance to the Team Magma Hideout in Jagged Pass in Emerald. This page was last edited on 25 November 2018, at 20:02. This page has been accessed 97,774 times.